My guest on Episode 38 of the Paul Kirtley Podcast is Justin Barbour, also known as the Newfoundland Explorer. 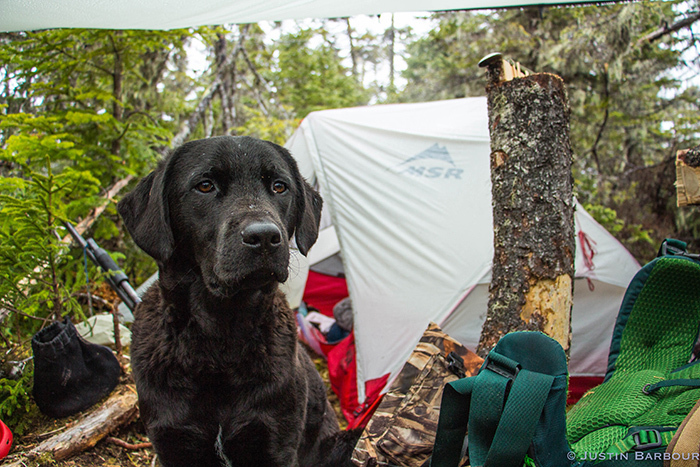 In the Spring of 2017 Justin and his dog Saku set off on a a traverse of Newfoundland. 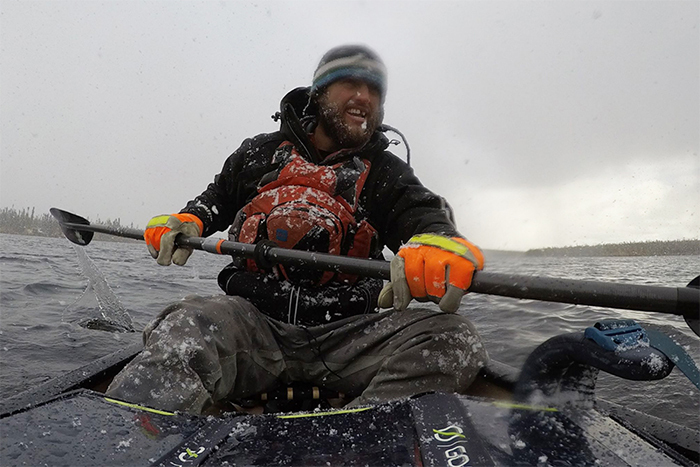 Starting on snowshoes and hauling a sled, Justin switched to backpacking and pakrafting once the conditions allowed. 68 days and 700km later, Justin and Saku had crossed the island of Newfoundland from West to East, beginning on the Gulf of St Lawrence and ending up in Cape Broyle on the Atlantic Ocean. The population density of Newfoundland is considerably less than Canada as a whole, which is not densely populated anyway, and the interior of Newfoundland is largely remote wilderness. In the conversation, we get into how Justin’s wilderness adventures escalated from a night or two out in the bush to a much grander scale. Justin described his 2017 journey as “a big challenge and an unforgettable blessing”. 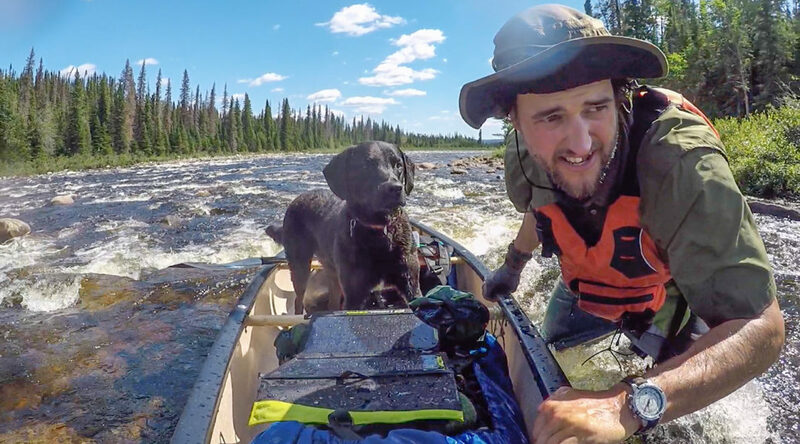 In 2018 Justin took on an even bigger challenge, this time in Labrador, the mainland part of the province of Newfloundland and Labrador, Canada, during which he covered 1,700km. We discuss these wilderness journeys, the skills he needed, the lessons he learned and much more. Plus we touch on what’s next for Justin and for his faithful companion Saku. 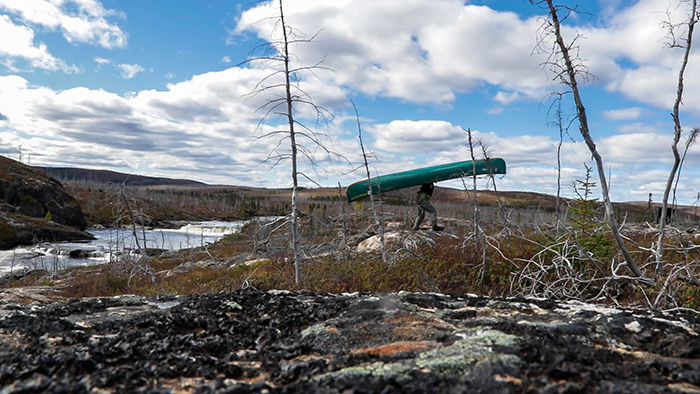 A bit of a portage… Photo: Justin Barbour. Saku guards camp. Photo: Justin Barbour. Things get chilly… Photo: Justin Barbour. Thanks for your comment. I’m glad you enjoyed this podcast so much. I’m also looking forward to seeing more from Justin on his YouTube channel, both the remaining episodes of the Newfoundland trip, as well as accounts of other trips too. Thanks for listening and I hope you enjoy future podcasts too. Keep going with the good work and hopefully we’ll see each other on another of your courses. Hi Davide, thanks for your comments and positive words about my podcasts. You are not the first to have suggested or requested that I make my podcasts available via Spotify and I’m glad you are in agreement this would be a good idea. I have already submitted my podcast to Spotify but as yet have not heard back with a confirmation it has been accepted onto the platform. I’m hoping I will have some positive news soon. And I will of course make an announcement when it has been. Glad to see you have taken an interest in Justin’s adventures. NL is beautiful place, and you should visit us sometime. You should also look out for the books A Woman’s Way Through Unknown Labrador, The Long Labrador Trail and Great Heart. There’s a whole saga surrounding this era of Labrador exploration that I find fascinating and I think you will too. You can find the books online through Project Gutenburg and/or the Open Library if they are not available from Amazon. Yes, NL is definitely on my radar. Thanks for the additional book recommendations. I shall add them to my reading list (which always gets longer, not shorter haha).